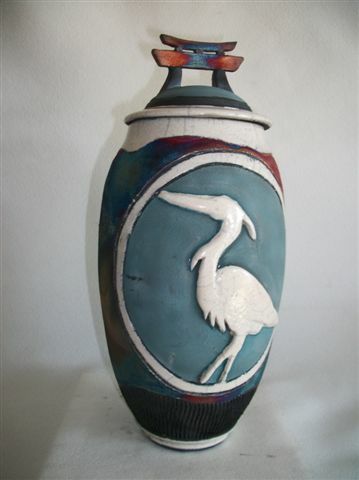 Jon Schneckloth is an Iowa artist who focuses on creating Raku pottery. 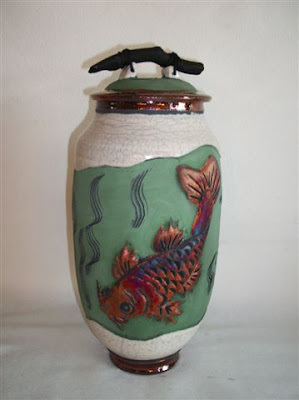 Jon explained that, "The meaning of Raku may be lost in history as there is no single word in the English language that adequately defines it. The terms 'simplicity,' 'austerity,' 'aesthetics,' 'tranquility,' 'enjoyment,' 'pleasure,' 'comfort,' 'happiness' and 'contentment' try to encompass its meaning. 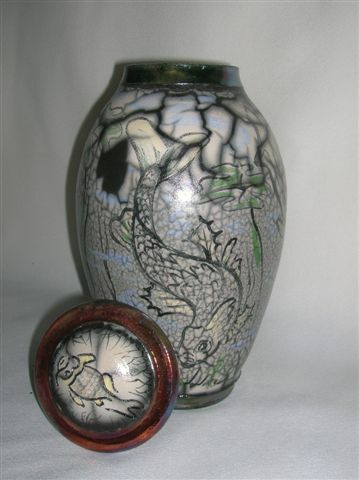 It basically originated in Japan in the 16th Century and ware produced in this technique was utilized in the Japanese tea ceremony, which was a part of their Zen Buddhist religion. Tea bowls and cups made through Raku were sought after as perfect compliments for the ceremonial drinking of tea. 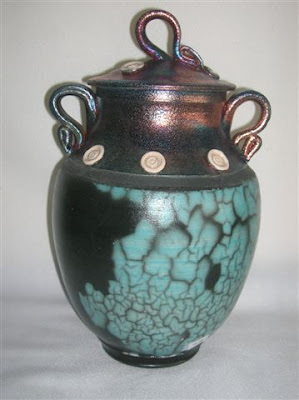 Their pottery defined their culture, much as the English Delft ware, German salt firings and American Indian pit firings defined theirs." 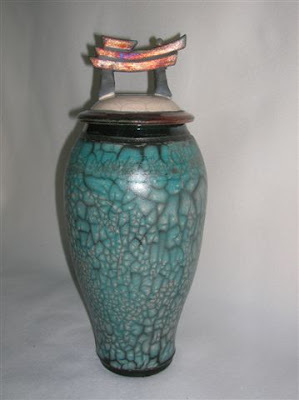 Raku pottery is several centuries old and has evolved with various cultures. Jon explains, "The Japanese made several hand-formed pots that were placed in an indoor kiln, brought up to temperature in a short time and the pots then removed with tongs to allow them to cool in the open air. It came to the United States in about the mid 1940’s and though it is deeply rooted in Japanese tradition, we now use contemporary manners in which to work. Forming methods and firing techniques have been manipulated in a variety of ways by succeeding artists to allow for more modifications. 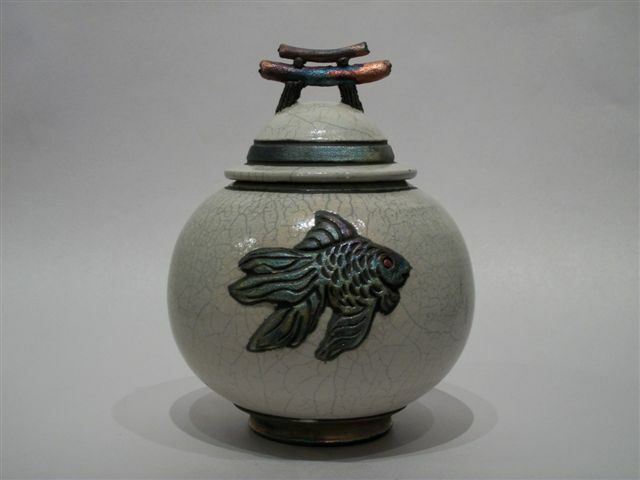 As with most things, the Raku process has been arguably changed for the different likes and desires of the artist and public. 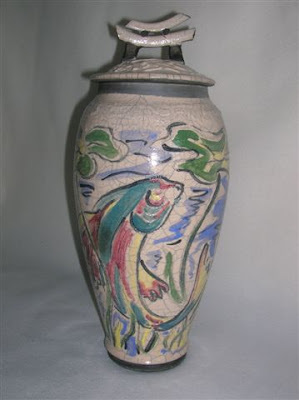 However, we still fire the ware quickly and remove it from the hot kiln, in comparison to other pottery types. And it is significant since it is one of the few pottery techniques where the artist can still alter the surface even after the actual firing is completed." Jon started his art in high school and continued to pursue it at the University of Northern Iowa. He deeply appreciates how art can provide multiple solutions to one question or problem: "I think it was because so many other areas required only one right answer/ one right procedure/ one correct method to solve a problem and in art, I found there could be more than one. I liked the idea of working with the elements of art and seeing more than one successful solution. Everyone saw the same model, had the same tools and yet all of us produced a different drawing. Art was unique." 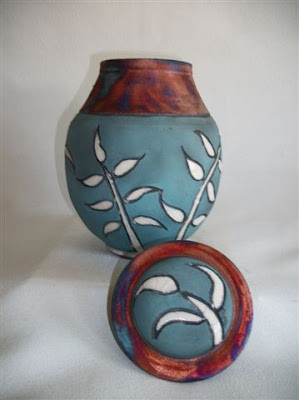 Jon finds inspiration in, "the tactile qualities of clay; squishy, malleable, firm, delicate, hard, smooth, rough, warm." He is also inspired by the challenge, "of a new day, a clean slate, a chance to make something better or more pleasing, a lasting impression." Jon has lived in Iowa all his life and finds joy in his family and home. One of his favorite part of being an artist in Iowa is the enthusiasm and support he finds in his peers: "I think the advantage of being an artist in Iowa is that the people I deal with, from artists, to gallery owners to the public, are some of the nicest people in the world. They are fair, honest, solid in their beliefs, helpful …. and some of them even like my work. The climate is never boring and the opportunities are boundless." He understands the importance of the fine arts to Iowa communities. "Art, whether visual or performance, keeps reminding us that there is more to life than working a job. It forces some people in some communities to be more open minded to possibilities. It makes us look beyond our self-perceived borders. It is a reflection of a community’s culture. It is a statement of who we are," he told me. I couldn't agree more! Jon offers some solid advice to other aspiring and working artists: "Be perceptive to your environment. Ask yourself many questions. Make time for your art and work hard at it, and never pass up a cookie."